As we step into a long awaited summer, we reflect back on a busy few months in fundraising, from golf days to pop quizzes and half-marathons in between…! ‘Rosemary Rockers’ steal the show at our annual Problematic Pop Quiz! As ever, the Problematic Pop Quiz started with a bang on the evening of Thursday 17th May as everyone piled into the Falcons Centre waiting expectantly for the questions and music to start! 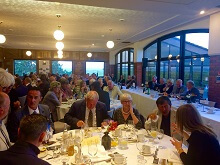 After some frantic raffle ticket selling and finding the right tables, Ken Chappell with help from Debbie, Chris and Jim Graham, kicked off the quiz and the room fell silent in anticipation. From Madonna to Michael Jackson, the questions covered all different genres of music appealing to everyone in the room, but it was the final round ‘guess the next line of the song’, which got the teams on their feet and singing out loud. After some number crunching and double checking of the scores, Ken revealed the winners – Rosemary Rockers! The Nurseplus shield was presented to the winning team, but not before the drawing of the raffle with help from Jerry Kenward. With a selection of fantastic prizes, including a haircut and a selection of fine wine, no one went home empty handed! We would like to express our sincere thanks to Ken, Debbie and Chris Chappell and Jim Graham (who have been carrying out these pop quizzes for over 20 years) for another entertaining and fun-filled evening. The running total of funds raised through pop quizzes over the years has amounted to almost £230,000 for Canterbury Oast Trust, which is truly amazing and has made a huge difference to our projects. Also, special thanks are extended to the Nurseplus team for sponsoring the event for the 11th year in a row with another incredible £500 donation. We are so fortunate to have the continued support of Nurseplus and enjoy having the ‘Ninjas’ with us each year! Thank you to everyone involved on the night, whether you were setting up tables, selling raffle tickets or helping to hoover when everyone had left! Your help is much appreciated in making these events run smoothly. But the question is, will Rosemary Rockers hold onto the shield for another year…?! As some of you may have noticed, we have a new face in the fundraising office! Hannah Baker started on Tuesday 22nd May and will be supporting Lucy Read in fundraising, helping with donations, events, volunteers and many other things beside. “Over the past 12 years while on holiday, John and I have met residents, parents and staff and it is always lovely seeing everyone and hearing all the exciting plans and news for COT. When we arrived in the Isle of White I joined the Townswomen Guild and over the years have heard people giving talks about their employment and hobbies. However last year the person booked to give our talk could not attend, so a number of members agreed to fill in, which is when I gave a 30 minute talk about my time working at COT. Many people were very interested as they had family, friends or knew someone with a learning disability or living in residential care. This then snowballed and in February 2018 I was asked to give another talk at The Townswomen Federation Conference in Sandown, Isle of White to around 100 attendees. After an S.O.S to fundraising where Emily was fantastic in providing me with leaflets and additional information to help assist me, my speech and the conference was a success. 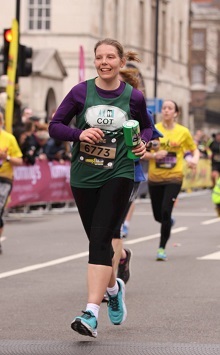 One particular fundraiser we would like to spotlight this month is the wonderful Marie Appleton who took part in the London Landmarks Half Marathon on 25th March 2018. The event sees 10,000 runners start on Pall Mall before heading through the City of Westminster and onto The City’s iconic buildings, before finishing next to Downing Street. Even more spectacularly, Marie took part in the Hastings Half Marathon a week before on the ‘run up’ to the big day! Marie raised over £150 for COT and said the event was ‘fantastic’. We are so pleased to have Marie flying the COT flag on the day and pleased to know she managed to enjoy the event too. Sunshine in Sandwich as golfers take part in Charity Golf Day! Special thanks to Derek Smith and Tony Alexander for organising the day and hosting an electric auction to close the event! We are so thankful to have the committed and continued support of the Rotary Club of Sandwich, who have helped us provide brighter lives for adults with a learning disability. On Wednesday 16th May, we were delighted to welcome along Trustees from the Cantiacorum Foundation, Chris and Nicola Hurton, who have so kindly donated £20,000 towards the Life Skills Academy build. Having also supported Harrington College in the past, this recent donation was the largest they have ever given to any one charity, so we feel even more fortunate and thankful for their wonderful support. 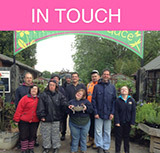 By visiting our various Life Skills projects, including Plants & Produce and Art at The Farm, they were able to meet with students, residents and tutors to better understand the scope of our work. We are very excited at the prospect of the new Academy in terms of the range of programmes we can offer students and shared this passion and objective with the Trustees. We look forward to welcoming Chris and Nicola along to the opening of the Life Skills Academy in September 2018. Last, but by no means least, we would like to wish our 3 Ride London cyclists GOOD LUCK as they take on 100 miles of thrills and exhilaration on Sunday 29th July in aid of COT. 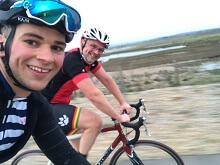 Our riders this year are father and son, Jamie and Joshua Clark, with their close friend William Murtagh. As keen cyclists, we are sure they will enjoy the day, but there are two infamous hill climbs on the day, which are a challenge even for the professionals! Thank you for taking part this year and wearing the COT vests with pride – best of luck.